COST from £614 pp. INCLUDes accommodation, all transport, guide, BOAT TRIP AND CAVE ADMISSION. EXCLUDES MEALS AND DRINK. AN ENCOUNTER WITH THE DRAMATIC AND WILD MOUNTAIN TERRAIN WITH AN ABUNDANCE OF LOCHS, WATERFALLS, AND FINE BEACHES. DESCRIBING THIS AREA WILL MAKE YOU RUN SHORT OF SUPERLATIVES! THIS TOUR IS CAREFULLY PUT TOGETHER TO ENSURE A GOOD CROSS SECTION OF WALKS THAT WILL TAKE US INTO STUNNING PLACES IN THIS WILDERNESS AND TO THE VERY FAR NORTH COAST. THE MIGHTY CAIRNGORM MOUNTAINS ARE PASSED THROUGH ON THIS Tour AND THERE WILL BE THE OPPORTUNITY TO SEE SOME OF THE STUNNING PICTISH STONES EMBOSSED WITH MYSTERIOUS SYMBOLS OF GREAT ARTISTRY. Cost: £758 pp based on 2 sharing a room, subject to availability in a very finely appointed hotel. Includes accommodation, all transport, guide, boat trip and cave admission. Excludes meals (other than breakfasts) and drink. Budget Cost: £614 pp based on two sharing a bunkroom, subject to availability. Same package and exclusions as above. Pickup from Edinburgh for 09:30 departure. Going north up into the Highlands at Dunkeld and over the barren Drumochter pass. 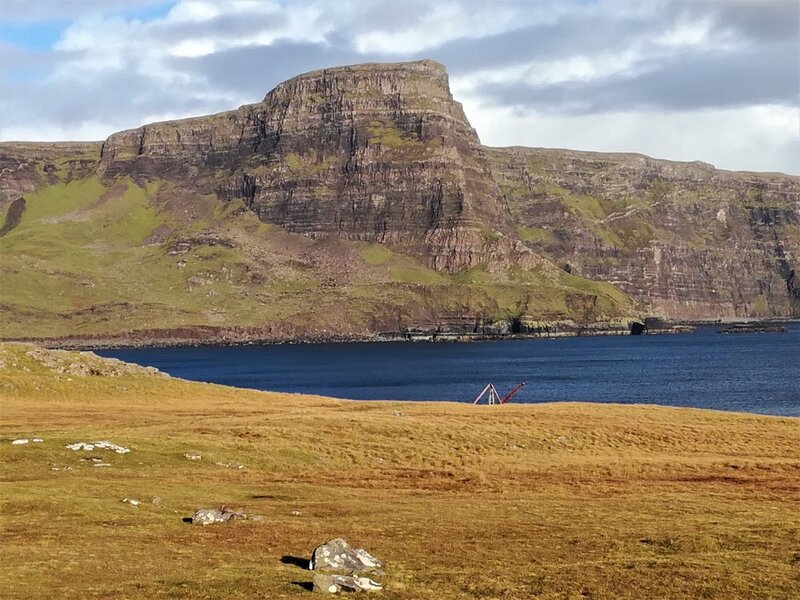 Travel over to the west coast for accommodation in Assynt. 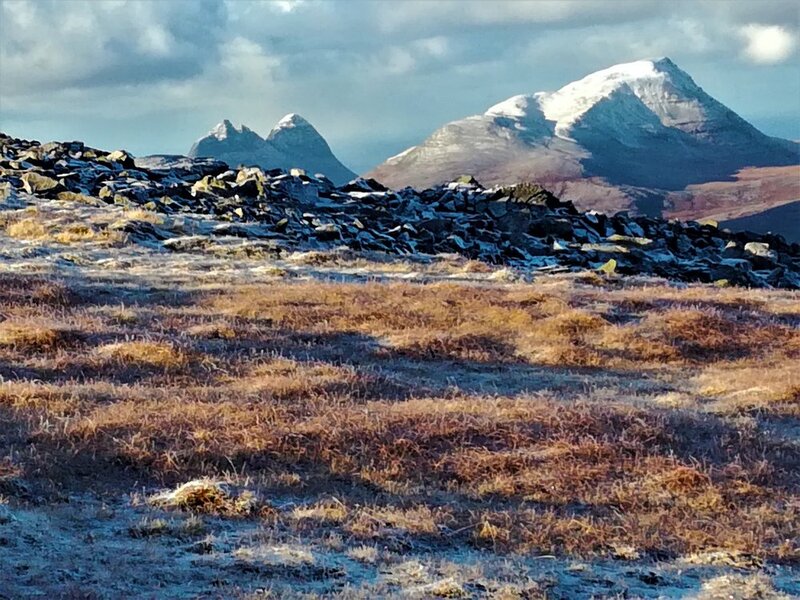 Travel around the spectacular, glacier carved Assynt region with its summits of rocky towers and buttresses. At the pretty coastal village of Lochinver, we’ll visit a famous pie shop and take our purchases for a picnic at a nearby sandy beach. 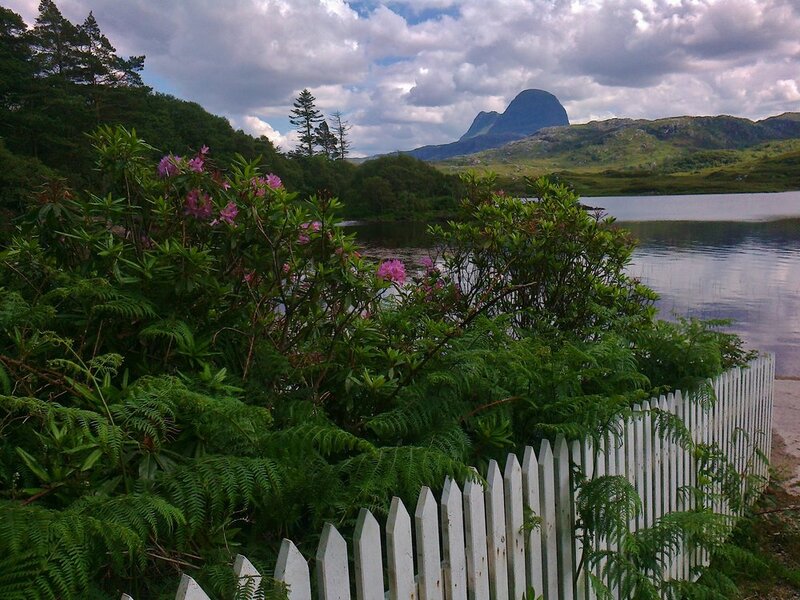 Drive past the stunning peaks of Quinag, and return to same accommodation. On to Kylesku for a highly recommended boat trip to see seals and possibly otter and other wildlife on the sheltered waters of a sea loch. We will sight Britain’s tallest waterfall. Drive to the far north, over the Kylesku straits and via the broad sweeping, desolate hills of the remote NW corner of Scotland. First we’ll reach the lovely stretch of water known as the Kyle of Durness before reaching the town of that name. Visit Smoo Caves. Good grippy footwear necessary due to slippery rocks. Requires agility to get into a rubber dingy down a ladder step. Return to Kylesku and an evening meal at the vibrant inn and on to accommodation. Heading eastwards through Strath Oykel passing through the beautiful woodlands of Rosehall, we’ll take in some of the Pictish Trail at Hilton, Balintore and Nigg, looking at the splendid incised stones of the enigmatic Picts who left these fascinating expressions of their mysterious culture in stone. Cross the Cromarty Firth on the Nigg ferry and visit the charming town of Cromarty. Onto Inverness going south through the Cairngorm National Park back to Edinburgh. Stop en route to enjoy the Hermitage Falls near Dunkeld Grading: Easy round walk of 1km along the level. Cost: £1,162pp based on 2 sharing a room and subject to availability. Includes cost of boat trips, but excludes accommodation, meals and drink. Budget option: £934 pp based on sharing a dorm in a hostel, for same package and exclusions as above. The Tour: same description for days 1 to 3. Then the itinerary includes Skye and is based on the mainland. Trip returns via Loch Ness and Glen Coe. Aiming for a boat trip to Isle Maree, visiting this special retreat of St. Mael Rubha and the graves of a Viking prince and princess. Hear tales of an island steeped in history, in a setting of outstanding splendour. Drive SE along Loch Maree – the loveliest of lochs - with the fine stocky mass of the peak named Slioch dominating the view. Take up our evening accommodation in this region. Driving up to the far north-west tip, we’ll walk out to Neist Point with its lighthouse, stunning cliffs and far reaching views to the Outer Hebrides. Drive over the Trotternish hills with their impressive formation and ascend to the Old Man of Storr. Meal out at a local inn with visit to the colourful island capital of Portree before returning to the same accommodation back on the mainland. Stop at the iconic Eilean Donan Castle which appears on calendars and film sets. On through Glen Shiel overshadowed by the tall and very steep ‘Five Sisters of Kintail’ then east to Invermoriston and Loch Ness, then driving the southern section of the loch to Fort Augustus and morning coffee. Many photographic opportunities of Loch Ness and the happy commotion of boats going through the series of locks at Fort Augustus on the Caledonian Canal. Down the Great Glen with views of Ben Nevis (Britain’s highest mountain) and up Glen Nevis for a walk either to a waterfall and gorge or upto an Iron-age hillfort. Tour ends with a drive down the entire length of Loch Lomond for late afternoon/evening drop-offs in Glasgow & Edinburgh.